February 15, 20111 - For the fourth consecutive year Bell Helicopter, hosted college students from universities around the United States at its company sponsored Engineering boot camps. This year, a total of 20 engineering students representing 11 different universities from across the country attended the boot camps. "Bell Helicopter has received an excellent response to our engineering boot camps. All the student participants are excited about the opportunity and have learned a lot from the experience," said Jeff Lowinger, Bell Helicopter's executive vice president of Engineering. "These boot camps have been a great tool to help Bell Helicopter attract top engineering talent. The students have provided new perspectives and innovative ideas that build on the current engineering team's experience and energize the entire Bell Helicopter engineering group." The two weeklong boot camps, held in the beginning of each year at Bell Helicopter's Fort Worth, Texas facilities, provide challenging learning opportunities for both the engineering college students and Bell Helicopter. For students, the week-long camps are a chance to work at a globally recognized aerospace company that allows them to see firsthand how engineers tackle real-world engineering problems. For Bell Helicopter, the boot camps are an excellent recruiting tool. 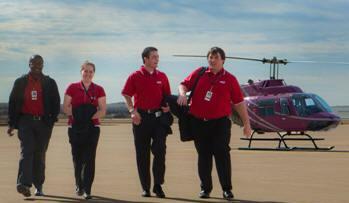 Attracting high-potential university talent is a strategic priority for Bell Helicopter. Innovative programs like the engineering boot camps and summer intern programs are a few of the ways to feed the recruitment pipeline and drive interest in aerospace engineering. "One of the most rewarding parts about being involved in the boot camps is introducing the students to the helicopter. Before they come to camp, few of them realize the complexity of the aerodynamics, control system and mechanical systems. They get to experience putting their hands on the machinery, flying the flight simulator and riding in a Bell helicopter. There is no substitute for experiencing a simple hover, where one feels that they are floating above the ground," said Stacey Kelly, Bell Helicopter engineer and boot camp drill sergeant. "There is certainly a ?cool' factor in helicopter design that the students catch pretty quickly." Bell Helicopter continues to look for innovative ways to attract high-potential university talent and the annual boot camps are one avenue to accomplish this goal. This year, boot camp students were given projects on the V-22 program, opportunities to collaborate with current Bell Helicopter engineers and tour Bell Helicopter's Texas facilities in Fort Worth, Amarillo and Alliance.